Pros: Pivoting head allows close shave to non-flat areas of your body, it charges up fully in about an hour and it can be used whether you're wet or dry. Cons: Does not run while charging, each charge lasts for only 30 minutes which may not be enough if your epilating several areas and its quite noisy. A lot of people dread the idea of removing their body hair. Aside from the pain that comes with the process, there are also a lot of uncomfortable effects that follow. Just think about ingrown hair, razor burns and accidental cuts. While Panasonic Ladies Wet & Dry Epilator can’t guarantee a painless hair removal experience, you can expect great results from using it. With multiple attachments and a pivoting head, this epilator is one of your best bet. It comes with two speed settings and a two-year limited manufacturer’s warranty to ensure you get the most out of the device. In case you’re looking for the inside Intel on this product, this review has everything you need to know. To make sure you get a flawless result, this epilator comes with properly aligned double disc. This enables the device to grip hair accurately for faster hair removal. Aside from speed, this feature also allows the epilator to pull your hair strands from their roots. It works well even on short and fine hair. What’s even great about those discs is that they come with 48 precision rotary tweezers. You can effectively use the epilator on your legs and arms where you tend to have more body hair. Unlike most epilators, Panasonic Ladies Wet & Dry Epilator is waterproof. You can use it in the bath with warm water and a shaving foam for a comfortable epilating experience. For a quick touch up, you can also use it on the go. And since it’s waterproof, you won’t have to worry about damaging it when you rinse it under warm running water. It comes with a small brush which you can use to get rid of any accumulated hair and gel buildup on its surface. You also get a travel pouch when you buy the device. You can use it to store your epilator when you’re traveling or just to safely store it at home. 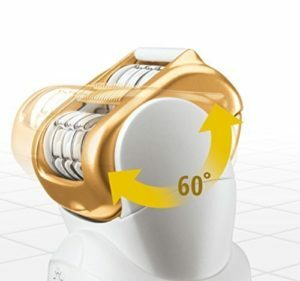 This Panasonic Epilator comes with a flexible head that can pivot 30 degrees forward and 30 degrees backward. This makes it efficient in conforming to the various contours of your body. It even has a contoured bikini comb which you can simply snap on to the device. It has a smaller head as well to target the fine lines in your upper lip area. This feature is actually common among modern epilators and it’s great to know that this product has it, too. Proper illumination is important if you want to make sure you’ve gotten rid of all unwanted hair in your target area. This feature is specifically helpful when you have a lot of thin hair that are easy to miss when you’re in a rush or when you’re in an improperly lit room. 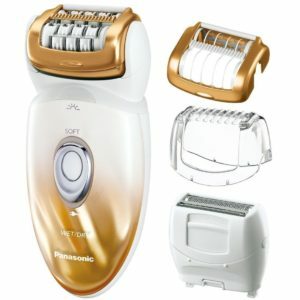 One thing that sets Panasonic Ladies Wet & Dry Epilator from its competitors is its shaver head. The product has hypoallergenic blades and foil to help you get rid of any unwanted hair on the sensitive parts of your body. It also comes with a pop-up trimmer to make sure you don’t miss out any stray hair. Similar to the actual epilator, you can also use the shaver wet or dry. Despite the short operating time of Panasonic Ladies Wet & Dry Epilator, a lot of users still find the product worth its price. Although it’s not able to give a virtually pain-free epilating experience, it does a great job in getting rid of unwanted hair, which a lot of people actually like. And since it comes with a shaver, you get two items and functions for the price of one. The Panasonic Ladies Wet & Dry Epilator has multiple head attachments to help you get the flawless skin you want. Despite falling short on its battery life, its waterproof and cordless design give you a lot of control during epilation. If you can live past the pain and the inconvenience of having to recharge it frequently, this epilator is definitely worth the shot.